Science and religion exist in the context of a society that supports both. (Or, possibly, opposes one or the other.) The items in this section explore how both science and faith interact within the various corners of our society. In God’s Mechanics, Brother Guy tells the stories of those who identify with the scientific mindset—so-called “techies”—while practicing religion. A full fledged techie himself, he relates some classic philosophical reflections, his interviews with dozens of fellow techies, and his own personal take on his Catholic beliefs to provide, like a set of “worked out sample problems,” the hard data on the challenges and joys of embracing a life of faith as a techie. And he also gives a roadmap of the traps that can befall an unwary techie believer…. This book offers an engaging look at how—and why—scientists and those with technological leanings can hold profound, “unprovable” religious beliefs while working in highly empirical fields. Through his own experience and interviews with other scientists and engineers who profess faith, Brother Guy explores how religious beliefs and practices make sense to those who are deeply rooted in the world of technology. 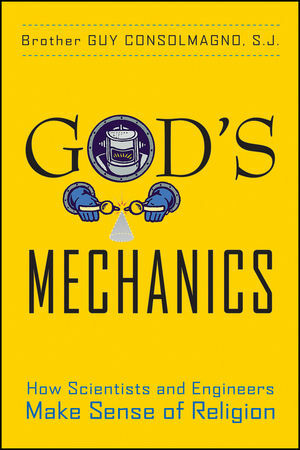 Click here for a link to the publisher’s web page for God’s Mechanics. Below is a copy of the official English translation of the full encyclical. Click here for a link to the Latin version. The French physicist and polymath Pierre Duhem was strongly devoted to Catholicism but insisted that science and religion were wholly independent. In an article of 1905 he reflected at length on the relationship between physics and Christian faith, using as an example the cosmological significance of the laws of thermodynamics. He held that it was unjustified to draw cosmological consequences from thermodynamics or any other science, and even more unjustified to draw consequences of a religious nature. I place Duhem’s thoughts on “the physics of a believer” in their proper contexts by relating them to the late-nineteenth-century discussion concerning the meaning and domain of the law of entropy increase. I also consider Duhem’s position with respect to Catholic science and culture in the anticlerical Third Republic…. Duhem was a scientist and scholar of unusual breadth whose contributions ranged from the history of medieval natural philosophy to mathematical physics. He began his academic career in the 1880s with works in chemical thermodynamics and continued over the years to develop this branch of science, intermediary between physics and chemistry, into still more general formulations…. Duhem counts as one of the pioneers of physical chemistry. Click here to access this article via Ebscohost (available in many libraries). Click here to access the article via Physics in Perspective. [A] handful of women… received public recognition in eighteen-century Italy, especially in Bologna, for their philosophical [scientific], mathematical, and anatomical knowledge. The instigator and director of these events was in most cases Benedict XIV… [who] used his moral authority and his sovereign power to encourage and reward women who excelled in the fields of philosophy and medicine, helping them obtain public honours and academic positions that were reserved for men during that era… They became “a symbol of the successes of the Bolognese science” chiefly thanks to Benedict XIV’s patronage. The connection between the promotion of modern science and not only the recognition of the intellectual dignity of women, but also the legitimation of a role for them within cultural institutions (almost) equal to that of men, was undoubtedly one of the most original and progressive features of Pope Lambertini’s reformist engagement, an engagement carried on the the context of the brief season of the Catholic Enlightenment, not by chance coincident with his pontificate. Click here for a preview of this article, courtesy of Google Books. For some non-religious respondents, being religious was incompatible with doing good science. The association between science and non-religion again emerged, as it had when Janet and I interviewed young atheists and it has in others’ research with non-religious populations…. Indeed, Jeff Guhin found people in the Evangelical schools in the US he conducted ethnographic research with affirming science as good, yet “To say scientist nearly always meant to say atheist.” Similarly, preliminary findings from the nationally representative poll conducted in Canada and the UK for the SRES project indicate a tendency not only to embrace scientific findings, but also to see atheism and science as aligned. In North America and the UK, science has cultural authority and it is strongly associated with non-religion. Click here to access this article from Cosmologics. For it is thanks to science that we have a greater understanding today of man’s place in the universe, of the connections between human history and the history of the cosmos, of the structural cohesion and symmetry of the elements of which matter is composed, of the remarkable complexity and at the same time the astonishing coordination of the life processes themselves. It is thanks to science that we are able to appreciate ever more what one member of this Academy has called “the wonder of being human”…. Click here for the full text of John Paul II’s discussion from the Pontifical Academy of Sciences web page. Click here for the full text of John Paul II’s discussion from the Vatican’s web page. In the classroom, scientists who do not hold a personal faith still have a responsibility to interact respectfully with religious students and not require them to hide their worldviews on philosophical, moral, or aesthetic issues. But many scientists adopt a dismissive or pejorative stance toward religious students, even suppressing discussion of religion altogether. Recall Raymond, a physicist we met earlier, who said that the views of religious students should not be considered because “they’re in the big time now”. Bear in mind also the implications of those sentiments expressed by the social scientist” who tells her students to put aside their religious beliefs if they want to succeed in her class. She seems to assume that studying religion from a scientific worldview is necessarily at odds with having personal faith—as if faith somehow dilutes or softens the brain—so much so that one’s religion must be put aside in order to engage in analytic and systematic science. If she wants her students to abandon religion in favor of science, her approach is counterproductive. Her nonreligious students will simply be encouraged to buy into the myth of science-religion conflict, and her religious students might abandon certain important scientific tenets (such as evolution) in an effort to maintain their faith. These negative ways of approaching religion in university classrooms often stem from lack of understanding of the diversity of religion. As pointed out in Chapter 2, a substantial portion of scientists have little present positive exposure to religion. We may even go so far as to call some religiously illiterate. One step toward religious literacy would be to find out more about the various faith traditions of their students. The levels of religious commitment among their students most often will mirror those of the general public, since religious and nonreligious persons now generally seek higher education at the same rate. I am not saying that scientists need to advance religion or religious causes they disagree with. Rather, they should be open to learning about the perspectives from which their students come. Other approaches to religious literacy might include exploring the ways in which various religions relate to science, or the role that religion has played historically in the academy. And still another way to broaden religious literacy would be to make efforts toward dialogue between secular and religious scientists. This 2018 article, published in the journal Ohio Valley History, revolves around the Cincinnati Observatory, the oldest professional observatory in the United States and the first public observatory in the Western Hemisphere. The full title of the article is “The Triumph of the Cross: President John Quincy Adams, Archbishop John Baptist Purcell, and the Reclamation of Cincinnati’s Mount Adams as a Sacred Site”. The author of the article, C. Walker Gollar, is Professor of Church History at Xavier University in Cincinnati. Mount Adams was the original site of the observatory, and the article traces conflict related to the observatory that stemmed in part from remarks that Adams gave in a speech for the founding of the observatory, in which Adams claimed that St. Ignatius Loyola founded the Inquisition. The article also traces the parallel history of the observatory and of a Catholic church on Mount Adams, as well as changing views about science both in the United States and among Catholics in the area of the observatory. Click here for an excerpt of the article. Click here to access the entire article through Project Muse (freely available through subscribing libraries). millennia has been a search for a balance between the practical and the symbolic. debate by shedding some light on its caliginous but potent undercurrents. All knowledge takes its nobility and dignity from the truth that it expresses. Only in the unbiased pursuit of truth do culture and especially science preserve their freedom and are able to defend it from any attempt at manipulation by ideologies or powers. ‘The truth will set you free’: these words from the Gospel enjoy perennial validity and illumine with divine light the endeavours of the scientist who refuses to subordinate his commitment and his research to anything but the truth. Truth is the goal of the whole universe: finis totius Universi est veritas, as one of the greatest thinkers of all time, Thomas Aquinas, wrote. The truth of all beings, their forms and their laws are hidden in the bosom of the Universe, which yearns for its truth to be discovered by the human intellect. You, Men of Science, who welcome the world into your minds, work upon it in your laboratories, and investigate its most secret byways in your dedicated efforts, what are you seeking if not the truth? Have courage and the boldness of reason that untiringly seeks the truth and you will find in the Church and in this Apostolic See your most convinced allies. Of course, the conquests of science are at times provisional, subject to review and rethinking, and they will never succeed in expressing the whole truth hidden in the Universe. The sense of mystery is part of your intellectual heritage and reminds you that what you do not know is much vaster than what you do know. In the search for truth, the boldness of reasons is linked with the humility of its own limits, the joy of knowing goes hand-in-hand with wonder at the unknown. Furthermore, the sense of mystery also envelops those truths which science cannot discover, but which question the mind of the scientist in the innermost part of his being, where he experiences an irresistible longing and yearning for the divine. The goal of the Universe is not only to reveal the truths it holds within itself, but to manifest the First Truth which gave the worlds its origin and form.All knowledge takes its nobility and dignity from the truth that it expresses. Only in the unbiased pursuit of truth do culture and especially science preserve their freedom and are able to defend it from any attempt at manipulation by ideologies or powers…. More than any other, the scientific community is a community of peace, for your rigorous search for the truth in the field of nature is independent of ideologies and therefore of the conflicts that result from them. Your activity demands sincere collaboration, and the frank communication of the results or your research. The scientific community, a community of peace, must be extended to all nations, through the foundation everywhere of institutes for the research and sound technological application. It is not enough that political colonialism has ceased; every form of scientific and technological colonialism must cease as well. I cannot fail to note with satisfaction that the Pontifical Academy of Sciences includes an ever greater number of scientists from all the nations of the world, with no racial or religious discrimination. This is a form of cultural ecumenism which the Church, as the promoter of the true religious ecumenism, cannot but regard with a sense or lively satisfaction. Click here for the full text of John Paul II’s discussion from a Pontifical Academy of Sciences publication of papal addresses (see page 257). How does religion work in a society shaped by science and technology? How do scientists and engineers practice their religions? How in particular does a Jesuit brother, and an MIT graduate with a PhD in planetary science, make sense of his Catholicism? In this 2009 talk, “God’s Mechanics,” based on his book of the same name, Br. Guy Consolmagno examines the personal religious life and theology of scientists and engineers — “Techies” — based on conversations with Techies in California’s Silicon Valley and a first-person confession from a Jesuit scientist and astronomer at the Vatican Observatory. This is a book by an artist and a scientist. The artist is Robert Wagner, who has produced several books of illustrated poems and translations of the Psalms, and created a stained glass window for St. Mary’s Iffley in Oxford. The scientist is Andrew Briggs, Professor of Nanomaterials at Oxford, who holds degrees in both physics and theology. The authors argue that over time, science and metaphysics have grown side by side as mankind has asked questions central to our existence. The book, published in 2016 by Oxford University Press, discusses a wide range of historical figures, from Anaxagoras to John Philoponus to Al-Ghazali to Kepler to Maxwell to the scientists working on the Large Hadron Collider. The use of illustrations is a prominent feature of the book. When young children first begin to ask ‘why?’ they embark on a journey with no final destination. The need to make sense of the world as a whole is an ultimate curiosity that lies at the root of all human religions. It has, in many cultures, shaped and motivated a more down to earth scientific interest in the physical world, which could therefore be described as penultimate curiosity. These two manifestations of curiosity have a history of connection that goes back deep into the human past. Tracing that history all the way from cave painting to quantum physics, this book (a collaboration between a painter and a physical scientist that uses illustrations throughout the narrative) sets out to explain the nature of the long entanglement between religion and science: the ultimate and the penultimate curiosity.